Hi there! It's Eddy again with another spotlight on one of our Eduphoria family members. 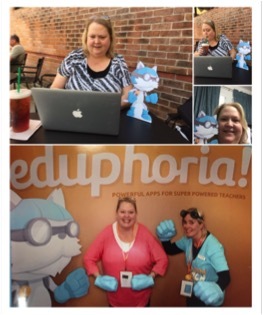 This time I am interviewing Paige Parker, one of our Eduphoria trainers. Eddy: So Paige, what do you do as a trainer? Paige: I get to travel to school districts and show teachers how Eduphoria can help them. Eddy: That sounds pretty cool! I get to travel to school districts as well and I like meeting new people everywhere I go. How long have you been doing this? Paige: I'm a rookie! This is my fourth fabulous month. Eddy: What's your favorite thing about working here so far? Paige: I feel like I'm still helping students and teachers by supporting them through Eduphoria. I believe in the applications and their power to help teachers use data easily and plan purposefully. Also, all the people at Eduphoria are fun! Eddy: Do you have any pets? Kids? Favorite people that you share your life with? Who are they? Paige: I have a four-legged kid--a terrier mix named Milo. He's the love of my life, and he has me well-trained. Eddy: Again with the dogs! Why doesn't anyone have cats? Moving on. Who was your favorite teacher in school and how did they impact your life? Paige: Mr. Lindsey (Keith), my Algebra and Geometry teacher at LCM High School in Orange, TX. He was incredibly patient for those of us who were math challenged. I learned from his example that every student is different, and you need to find their learning style to help them understand the content. Eddy: He sounds like a great teacher! Now, if you were famous, what would you be famous for? Eddy: Hey that's pretty cool! How do you like to spend your free time? Eddy: What's the one movie you could probably quote every word to? Eddy: Oh, that movie is too scary for me! Eddy: Those Rodents of Unusual Size! I can chase mice all day, but they are usually computer mice. Eddy: Who is your hero and why? Paige: Right now, it's my mom. She just went through cancer surgery at age 86, and she was a trooper. I am so in awe of her strength and courage. Eddy: Wow, I can see why she is your hero. What TV show would you like to live in? Paige: Downton Abbey, as long as I can be part of the upstairs group! Eddy: OH! Have you seen Downton Tabby? It's fantastic! I had a great time hanging out with Paige and I think she is a super fun addition to our Eduphoria family. Also, she promised to check out Downton Tabby, so I overlooked the fact that she didn't have any cats.